Imagine an individual capable of fully using the human body's physical and mental skills to such a degree that the highest human development is made possible. This is the goal that all traadtional karate practitioners strive to attain. 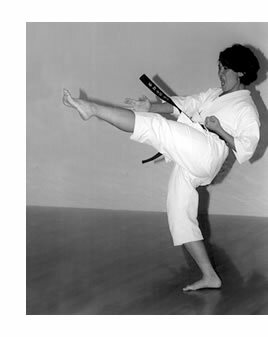 As such, karate is not simply a series of punching, kicking, blocking and self-defense techniques. Karate is an art that through its application promotes mental and physical human development. As a physical fitness method and form of athletic competition, karate today enjoys an ever-widening popularity. As an effective method of self-defense, it has attained worldwide attention and admiration. As the national traditional karate governing body in the United States, the American Amateur Karate Federation (AAKF) is organized as a public benefit, non-profit corporation, whose purpose is to improve the physical and mental health of the U.S. public through karate. Internationally, the AAKF is a member of the Pan-American Traditional Karate Union, founding member of the North American Traditional Karate Federation, and is the U.S. Representative to the World Traditional Karate-Do Federation (WTKF), the world traditional karate governing body. In the karate world, the United States is among the strongest proponents of this martial art. This international prominence is the result of continuing AAKF activity. For example, the U.S. hosted the first international karate events: The United States vs. Japan Goodwill Matches and the 1st World Invitational Karate Tournament. The AAKF is organized by U.S. karate clubs and organizations that have found a mutuality of purpose and interests in the aims and objectives of the organization. Since the passing away of Mr. Hidetaka Nishiyama, Founder and President of the AAKF, the federation has reorganized itself as an organization administered democratically by representatives of each reagion of the United States. The current president of the AAKF is Mr. Alex Tong, and Mr. Robert Fusaro is the chair of the technical committee. Internationally, Mr. Mahmud Tabassi serves as the vice-president of the WTKF, which has taken the mantle of world-wide promoter of Tradional Karate (Dento Karate-Do). Establishing standards for competition rules, judging qualifications, examiner qualifications, athlete qualifications. The AAKF also sets ranking standards in accordance with the international standards. It then employs these standards when it sanctions and conducts national competitions and when granting inernationally recognized ranking recognition to U.S. karate practitioners. Sending the U.S. National Team and Officials to the world championships, continental tournaments and other international events. Participation in these events promotes athletic exchange and international goodwill. Planning and executing U.S. karate development programs. Aiding and fostering member club development plans. Supporting karate education, training and related academic initiatives. Promoting the proper understanding of karate to the U.S. public.